PCD Pharma Franchise in Arunachal Pradesh – Innovexia Life Sciences is a top leading pharma company in India. We are WHO certified pharma company that manufactures the wide range of pharma products & export all over India. If you want to invest in a pharma franchise company which could provide you good earning and career in the pharma industry for future than we are the right choice for you. We are offering PCD Pharma franchise in all over India. So if you want best PCD pharma franchise in Arunachal Pradesh then we are the best option for you. We want to serve people with the best Pharma products, therefore we are now in Arunachal Pradesh. Innovexia Life Sciences is the best PCD Pharma company that is offering the great opportunity with great career aspects in pharma industry by offering its PCD Pharma Franchise in Arunachal Pradesh. The pharma dealers, pharma distributors, medical representatives and stakeholders are invited from all over the country to our PCD Pharma Franchise partner. Innovexia Life Sciences is Chandigarh based pharma company we are the perfect combination of resources and skills and this is the reason for our rapid growth in this highly competitive environment of the healthcare sector. We want to manufacture medicines which are effective, good in quality with fewer side effects on the body for the health of the people across the globe. Our medicines are innovated with the best element in it which we take from our trusted vendors and these raw material are best in quality. We always look forward to the long-term sustainable relation with our clients or partners. We also manufacture products on the contract basis. People trust us we believe in transparency, we do not think that we need to hide anything from our partners. We are standing well in this highly competitive industry. We are looking forward to becoming India Top most pharmaceutical company and rule the foreign pharma market as well. So we are providing PCD Pharma franchise in Arunachal Pradesh that will be the best business opportunity. We are headed by Mr. Sandeep Khajuria and Mr. Rohit Sharma who is the pioneer of this industry having valuable experience of more than 16 years in different sectors of pharma industry like Human Resources], Production, Distribution, Sales & Marketing at different level in management category in various reputed companies, like Cipla Ltd and Dr. Reddy’s Lab. ‘The Land of Dawnlit Mountains’ Arunachal Pradesh is a hilly state located in the north-east part of India. It is the land of incredible beauty. Innovexia Life Sciences is now in Arunachal Pradesh providing its PCD Pharma Franchise to those who wants to have the good career in Pharma industry, We are best PCD Pharma Franchise Company who value your investments. We will you grow your business with us, by working together we can achieve our goals. We will be looking for the Pharma Dealers. Pharma Distributers, Medical Representatives, and Stakeholders from all the districts of the Arunachal Pradesh such as Itanagar, Bhismaknagar, Malinithan, Pasighat, Tawang Town, Ziro, Bomdila, Roing, Tezu, Anini, Bhalukpong, Northeast India etc. Grab the best offer which could change your career by making it secure and bright. What are scopes in future for PCD Pharma Franchise in Arunachal Pradesh? The economy for Arunachal Pradesh is increasing with time with every decade it is getting better. The people of Arunachal Pradesh are getting educated and becoming aware towards their health. With the rise in the income of the people, their lifestyle is also changing and this change can also be seen in their health. People now take very health issues more seriously. This is an emerging sector which is having a lot to offer in future due to the high demand for medical products. The health sector is the only sector which will improve more and more with time and demand will increase thus investment in this could be proven best for you. The Pharma industry is expected to grow good in the coming time which is good for the pharma industry. The government too is paying special attention in this sector so that everyone could get the better and healthy life by opening hospitals in almost every districts, healthcare centers even the private sector is also investing well in pharma industry because they also know the scope in this area is high. The government had made many plans to encourage the pharma business in our country, with time this sector will grow more and coming the time this sector will emerge as the most profitable one. All the products after manufacturing are stored spacious and germ free zone for shipping. We are best at logistic, this helps us in delivering right products at the right location with in time. The Company uses the best quality packaging material to ensure long shelf life for all its medicine. This is why we are among the best Pharma Franchise Company in Arunachal Pradesh. Promotional tools are required by pharma distributors to sell pharma products. So we offer the best quality pharma promotional tools to our pharma franchise partners. This will also help in building good image before the health professionals and customers. It could be helpful in increasing your network as well. Find the following list of promotional tools. Brochures and product cards, etc. Our free of cost promotional tools will help our Pharma Franchise associates to do well in the industry. Our business partners will get the best support from our end to do well in this highly competitive market. All our business partners will get all marketing and promotional facilities from the company to set up business successfully. 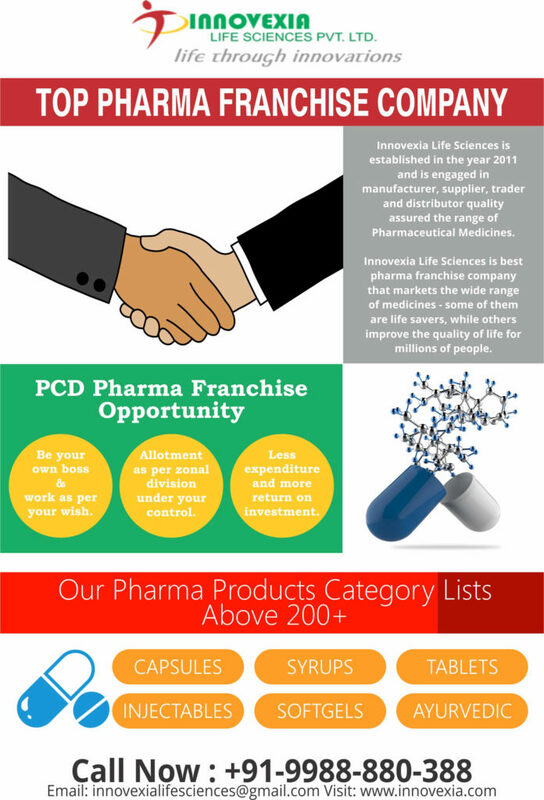 Why Choose us to become our PCD Pharma Franchise Partner? We are having more than 200 products in our wide range of products. We are having more than 250 associates all over India. Our products are best in quality, highly effective and affordable. We will provide you with the promotional kit. Incentives will be given on the completion of the annual target. Be the part of this innovation-driven pharmaceutical company and start your own PCD Pharma Franchise business in Andhra Pradesh. Innovexia Life Sciences offers the best quality range of drugs at the affordable prices and ensures to deliver all products on time. Grab the opportunity to start your own successful business in pharmaceutical industry. The person is surely needed to have your own Drug License No. (D.L.) Number and Tax Identification Number (TIN) which is compulsory. The person needs to have the minimum of 3-5 years of working experience in a reputed Pharma Company or a registered Pharmacist under State Pharmacy Council. One should make the investment of 3-5 lakh so that you may get the better return on your investment later. So if you have the plan to start a pharma franchise business in Arunachal Pradesh then join the hand with Innovexia life Sciences. We are offering best pharma business opportunity for Arunachal Pradesh.